-They are high in bio-available vitamin C, containing more than 60 times the amount found in oranges. Because of this they are used to boost the immune system as well as stimulate collagen production and reduce wrinkles and fine lines in the skin. -The vitamin C in rose hips helps the body better absorb iron. -They contain GOPO fatty acids and are sometimes considered the plant version of fish oil, helping to control inflammation and reduce arthritic pain. - Studies have indicated they may be effective at lowering blood sugar levels and increasing glucose tolerance. -The essential fatty acids in rose hips can help prevent scarring and encourage skin regeneration. -They contain quercetin which has been found effective in helping to prevent melanoma. 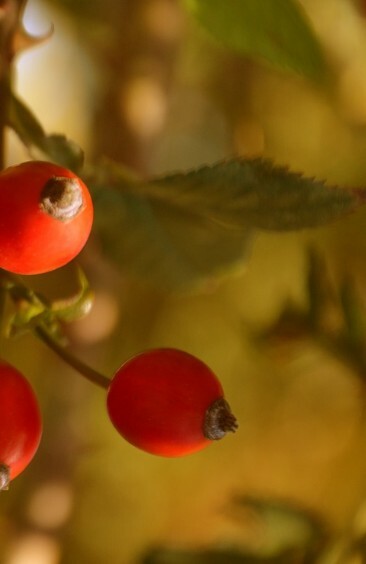 -Studies indicate that rose hips may be useful in the treatment of kidney disorders. All roses will produce hips, but the rosa rugosa species is one of the most widely used and is said to have the best flavor. Hips are best harvested after the first frost, as their flavor sweetens and the bush has transitioned into dormancy. Harvest the hips that are firm and plump, and leave the softer, shriveled fruits for the birds to feed on during the winter. To prepare your harvested hips, cut the stem end off with kitchen scissors or a knife, then slice the hip in half and remove the seeds. Rinse the hips then either use them fresh, or cut and dry them to store for later use. Steep 2 tablespoons fresh chopped rose hips, or 1 tablespoon dried rose hips in one cup of boiling water for 5 to 15 minutes. Strain and serve. You can also sweeten this tea with raw honey if you prefer. In a small double boiler, add 2 tablespoons dried rose hips to 1/2 cup extra virgin olive oil. Heat the oil to 105 degrees then remove from heat, cover, and let sit for at least 2 hours or optimally up to two weeks (I like to start my oil on the new moon and finish it on the full moon for maximum potency). Strain out the oil and bottle with a tight-fitting lid. Store in a cool place away from direct sunlight. Properly stored, this oil should last for at least 6 months. Optionally you can add four or five drops of essential oil such as lavender and/or 1/2 teaspoon vitamin E oil to increase shelf life. *never use fresh herbs in an oil infusion, as the water content can cause the oil to go rancid.